Through the established "tenners" at 29 institutions of higher learning in Norway, students can choose to support our projects over their semester fees. The money will help support higher and informal education for youth in Bolivia, Nicaragua, Zimbabwe, Zambia and South-Africa and North/South-information in Norway. 1. What are the established "tenners"? - The student democracies at the different institutions of higher learning in Norway which are members of SAIH, can choose to add the SAIH tenners on the semester fee. Six universities and 23 university colleges have SAIH tenners. The support is voluntary. - Collected funds are distributed between SAIH's projects within education for development in Zambia, Zimbabwe, South Africa, Bolivia and Nicaragua (minimum 70%) and advocacy, informational work, and administration in Norway (maximum 30%). 3. How many students pay the tenners to SAIH each semester? - Approximately 160.000 students pay the SAIH tenners each semester. 4. How much does one pay each semester? - The SAIH tenners are, at the majority of the institutions, 20 kroner each semester. The institutions connected to SiO (Studentsamskipnaden i Oslo/The Foundation for Student Life in Oslo) and SSiN (Studentsamskipnaden i Narvik/Narvik University college) give 30 kroner each semester. 5. How much money does SAIH get from Norwegian students? - In 2009, 6,8 million Norwegian kroner was given to SAIH. 6. Are the SAIH tenners voluntary? - Yes. Students choose through their democratically elected organs to become members of SAIH and possibly apply a tenner system. It is a prerequisite that the established tenners are voluntary. SAIH tenners are administrated with the semester fee, and if the student can not deduct the 20 or 30 kroners from the semester fee before paying. one can get a refund on SAIH's webpages. Send an e-mail to saih@saih.no with name, account number, name of institution and e-mail address and we will refund your donation. SAIH encourages the institutions to have their own solutions in which students can reserve from paying the SAIH tenners. The current tenner agreement is recognised according to the Law of the student life foundations § 10 (and §16 in their regulations). 7. How many get their SAIH tenners refunded each semester? - SAIH does not have an overview of how many students that do not wish to pay since the collections are administered locally by the student life foundations (see point 1). 119 persons asked for their tenners back in 2007. 8. Does SAIH get economic support from others? - Yes. SAIH gets money for development cooperation, information work and local chapter activity. SAIH's local chapters get resources from a project grant through LNU) (Landsrådet for norske barne og ungdomsorganisasjoner/The Norwegian Children and Youth Council). SAIH gets support from Norad (Direktoratet for utviklingssamarbeid/The Norwegian Agency for Development Cooperation) in order to inform about development and North/South- issues. SAIH also gets support from Norad, Operation Dayswork (OD) and FOKUS (Forum for kvinner og utviklingsspørsmål/Forum for women and development) which goes to development cooperation. 9. What projects do the SAIH tenners support this year? SAIH tenners are not a fundraising campaign awarded to different causes each year, but supports long term projects in different countries. We support projects run by local organisations because closeness to the local challenges is necessary to make a change. All projects fall under one of SAIH's thematic programs. See point 12. 10. Which countries does SAIH operate in? - SAIH supports education projects in Zambia, Zimbabwe, South Africa, Bolivia and Nicaragua. 11. Does SAIH work with emergency aid? - SAIH does not do emergency aid. SAIH wants to change the underlying causes to injustice and inequality, and to assist people in improving their life situations . SAIH therefore works with long-term aid to higher education and training and SAIH's motto is "Education for Liberation". The vision is civil, political, economic, social and cultural liberation. 12. What aid programs does SAIH operate? 13. What is a local chapter? 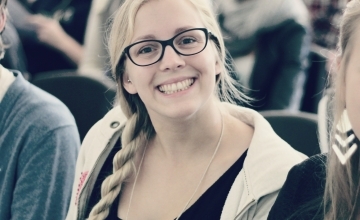 Volunteers have always been and still are the foundation of SAIH's work in Norway. Today there are nine local chapters spread around the different institutions of higher education. SAIH's local chapters arrange a wide range of activities, such as debates and seminars, culture evenings, concerts and campaigns. In a local chapter you can also learn more about development cooperation and international politics. 14. What is the political theme? SAIH's Annual Assembly each year chooses a political theme. This theme is the foundation for a national campaign at Norwegian institutions of higher learning the following year. The theme must be well grounded in SAIH's areas of competence, be a relevant theme for our partners, and also hold the potential for cooperation and networking in Norway and internationally. It is first and foremost the local chapters which work on the political theme at the different learning institutions.